Jose Escobar thought his wait was finally over in 1990. It wasn't, he just had to wait a little longer. Playing for the AAA Syracuse Chiefs in the Blue Jays organization - in his 12th season as a pro - Escobar hit .270 in 79 games. It was a good enough showing to raise expectations for September, and the first call up of his career, according to The New York Times. September came and went without that call. that call finally came the next April, with a new organization and in his 13th total season. 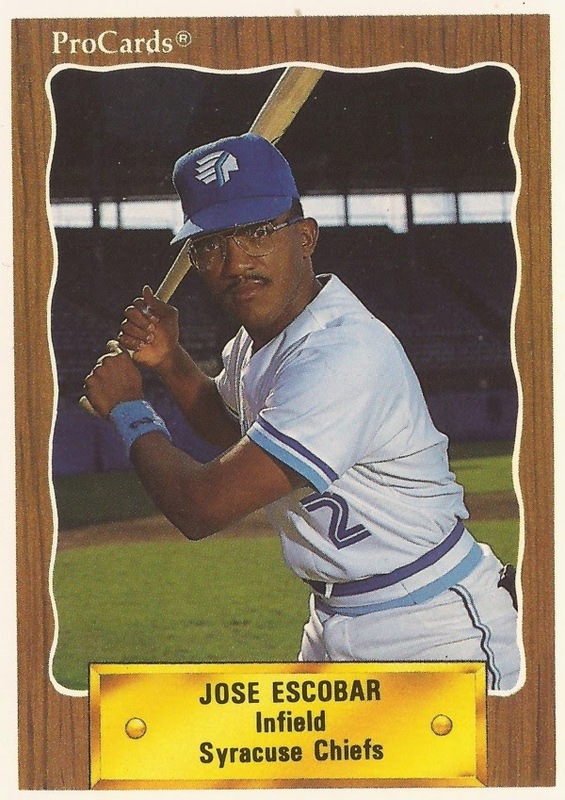 Escobar's long road to the majors began back in 1979, signed by the Blue Jays as an undrafted free agent out of his native Venezuela. He started at short-season Utica, playing there his first two seasons. He hit .265 his first year there and .234 his second. Escobar moved to single-A Kinston and Florence in 1981 then returned to Kinston the next two seasons. He got his first look at AA in 1984, at Knoxville. There, he hit .235, with 45 RBI. To start 1985, the Blue Jays sent Escobar and two others to the Phillies for Len Matuszek. Escobar split the year between AA Reading and AAA Portland. At Portland, Escobar hit .321 in 46 games. Escobar was then released by the Phillies and signed back with the Blue Jays. Over the next five seasons, Escobar split time between Knoxville and AAA Syracuse. The outfielder, though, never played in more than 81 games. In 1988, he played in just 57. That spring, Escobar knocked in two in an exhibition win for the Blue Jays. In 1989, he also played 23 games with the Royals at AAA Omaha. His final year with the Blue Jays system came in 1990. For 1991, he signed with the Indians. He also made the majors for the first time that April. He debuted April 13 in the field. He got his first at bat two days later and his first hit April 22. The hit also came with an RBI. Escobar ended up getting three total hits in 15 at bats. His final appearance came May 15. Sent back to the minors, Escobar played 45 games between AAA Colorado Springs and AA Canton-Akron, ending his career. Escobar's impact in the majors has gone on. Escobar is the uncle to Royals shortstop Alcides Escobar. In a spring 2010 interview, Alcides Escobar counted his uncle Jose Escobar as one of his heroes growing up. MLB.com, March 1, 2010: Escobar next Venezuelan star at short?